The present book provides an information of geographical research trends at the international level for understanding of the structural process, in a given environment over Space and Time (S and T). 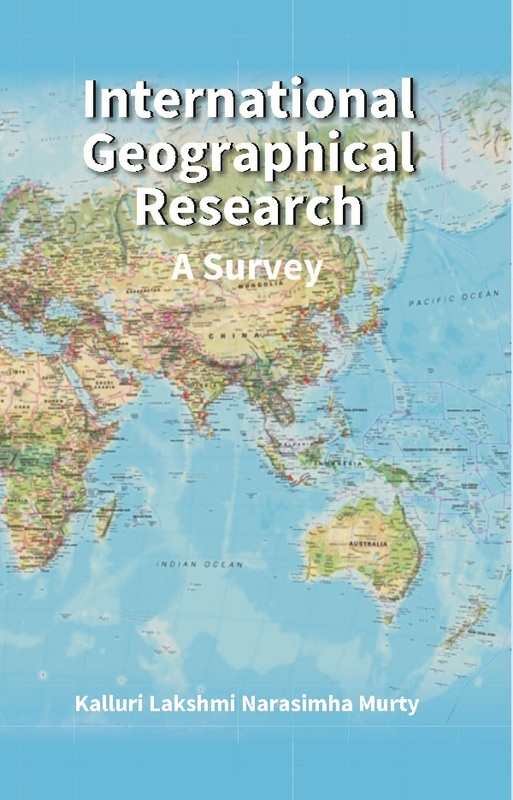 The volume leaves an indelible mark for research on the spatio-temporal analysis of international geographer's contribution upon different continents. The total research survey has been conducted at these levels (i.e.) macro level at the international level, Meso level @ Nation's level and micro level at district head quarters university and its performance. This volume has been divided into 9 chapters; Introduction is presented in the first chapter. Second, third and fourth chapters deals with physical geography, economic geography and urban geography respectively. Fifth chapter deals with rural geography and regional geography. Applied bibliometric Seventh chapter has been designed to present “Progress in Indian Geography” and also referred and presented six papers of 33rd International Geographical Congress, Beijing, China, Asia. Micro level planning and integrated area development studies are presented in the seventh chapter. Finally, conclusions are presented in the ninth chapter besides presenting a way forward for geographers to put in extensive efforts and intensive efforts in order to reach highest point in geographical research, two research papers have been presented, one deals with the evaluation of research papers and evolution and evaluation of rural resource base, pattern of development and changes in Vegeswarapuram,Tallapudi mandal, west Godavary district, AP, Inadi to help young research students. Dr. Kalluri Lakshmi Narasimha Murty was born on second September, 1949 in Vegeswarapuram, had his school education in P.S.J.B. School and K.S.R.Z.P.H. School over a period of eleven years (1955-1966), Graduated from D.N.R. Collage, Bhimavaram, affiliated to Andhra University, Waltair. He had his M.A. (Geography) with specialisation on Agricultural Geography, Osmania University, Hyderabad in 1973 a Ph.D (Regional Planning) from Andhra University, Waltair in 1985. He worked as Junior Lecturer, Senior Lecturer and Reader in Geography in Government College, Rajahmundry, Government College (Men) and Government College (Women), Srikakulam from 1976-2006 July and from 1st August to April 22, 2007 as Principal (FAC), Government U.G. and P.G. College (Women), Srikakulam and 23rd April, 2007 to 30th September, 2007 as Principal, Government U.G. and P.G. Collage (men), Srikakulam. He has received the A.P. State award in recognition of the best services rendered as teacher in 1995 and an author of 15 books. Nine research projects were completed, among them are, one in Government College (Men), Srikakulam and in Government College (Women), Srikakulam and had completed Flood Prone Areas and Drought Prone Areas, financed by UGC, New Delhi and S.R.C. UGC, Hyderabad, Andhra Pradesh respectively. Andhra Pradesh State Level Seminar on “Environment and Development” was conducted with the assistance of Indian Council of Social Science Research, ICSSR, Southern Region, Osmania University, Hyderabad and CPDC, GCUG & P.G. (Men), Srikakulam, on 25th and 26th September, 2007 in Government UG and PG College (Men), Srikakulam, AP. India. • Individual Efforts of the Author • Spatial Units for Sampling • Objectives • Time Element • Report • Conclusion. Thinking & Geographic Information Science • Land-Use & Land Cover Dynamics • Land-Use Geography/PoliticaI Economy • Analysis • Gaps in • Research • Task Ahead • Notes. Assessment • Conclusion • Notes. • Urban Ecology and Urban Environment • Urbanized Lands • Urban land cover • Urbanization • Environmental Governance / Urban Geography • Methodology • Globalization & Technology • Urban Growth • Refugees & Settlements • Resettlement Issues • Urban Sprawl • Urban Workers and Immigrants • Urban Poverty • Rural - Urban Interaction • Immigration • Urban Health • GIS Methodology • Remote Sensing & GIS in Urban Studies • Tec & Economy • IT and Software Services • Culture Qatar Pride / Urban Geography/ Global visibility • Gaps in Literature • Step • Future areas of research • Conclusion • Notes. advantages & disadvantages • Natural Hazards • Economic Globalization • Gaps in Research • Future Research • Conclusion • Notes. (Horizontal) • Degree of Collaboration • Conclusion • Reference. Remote Sensing and GIS Methodology • Urban Geography • Urbanization • M.P. State//Capital// • Two Cities • Rural - Urban Fringe • Study of Taluk in a District Framework • Kashmir Valley • State Study • Land Use and Agriculture • Enterprise Development / Tea-Culture • State Level Study - Haryana • District Study • Infrast ructural Facilities • Rural and Regional Development - Koppal District • Regional Development • Gaps in Literature (Observed) • Tasks Ahead • Observations • Conclusion • Notes. Scope of the Study • Objectives of the study • Hypotheses • Methodology • Factor Analysis Method • Sectors and Development Indicators: • Economic Infrastructure • Social Infrastructure • Population • Nature, level of study and methodology • Research Design (Policy decisions) • Present Study • Plan Period 2011-2021 • Tentative Chapaterization • Bibliometric Analysis • Applied Bibiometric Methodology • Analysis Observations • Part-b • Introduction• Literature• Role of Periodic Markets and Rural Development • Objectives of the project • Hypothesis • Research Design • Methodology • Tools for collection of data • Plan Period • Significance of the Study • Relevance to the present day problems and needs of the society and the Country • Likely Contribution to Knowledge • Reference • Part-C • Year of Establishment: 1985 • Table-81Faculty • Courses Offered • Activities • Analysis • Conclusion • Notes. the entire text of the survey has been designed and organized with the sub-heads. • Conclusion. of Articles (loss and gain analysis • Gross Observations • Ranking of different authored papers • Findings • Conclusion • Notes.